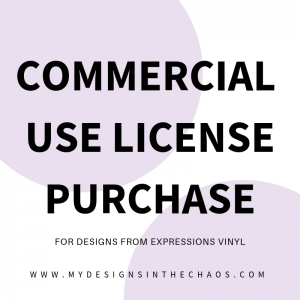 Making a shirt with multiple colors of Heat Transfer Vinyl can sound a little intimidating at times but I’m here to encourage you and show you, that is is totally possible and not too difficult. 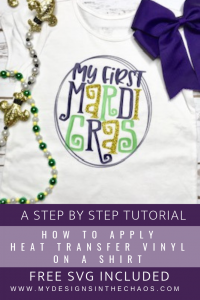 This short tutorial today is on how to layer heat transfer vinyl for when you have a design with multiple colors of vinyl you want to use. We have also put together this video tutorial as well. Feel free to scroll down to get the SVG file for free! PLEASE NOTE THAT THERE ARE AFFILIATE LINKS IN THIS POST. THAT JUST MEANS THAT AT NO COST TO YOU WHEN YOU SHOP THROUGH OUR LINK WE EARN A SMALL PERCENTAGE OF THE SALE. Check out more of our favorite supplies in our Amazon shop here. 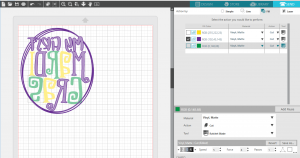 This first thing that needs to be done (as with any cutting machine project) is the design itself needs to be cut out on your machine. In Silhouette Studio Designer Edition and in Design Space it is very easy to cut by color. Select which items to be cut in which color and then load and cut. Also don’t forget to mirror your image before you cut! It is always super frustrating when a sheet of HTV is accidentally wasted. Once each of the layers of your vinyl colors are cut it is now time to weed. I explain in more detail here exactly what weeding is but basically, you will just remove all the vinyl that you don’t want pressed on your shirt. Do this for each of the colors that you cut in the previous step. Next up it is time to line up the design. We talk here about how to make sure your design is totally centered on your blank but this step is to make sure that each of your layers are lined up with each other. Once you have the design stuck together and lined up exactly the way that you want, place it on the shirt. Peel up all the layers except the bottom one, then head on to the next step. *If this sounds a little confusing take a second and watch the video. I think in this case seeing is understanding. Now it is time for the final step, pressing the vinyl to the blank. Press the first layer for 5 seconds at 315 and then remove the carrier sheet. Make sure to use a pressing pillow and teflon sheet. It will help to ensure that the vinyl gets a good press and none of the garment seams get in the way. If you are looking for a more affordable pressing pillow option check out this tutorial. Then repeat that process with all of the layers. When you get to the last layer and you have removed the carrier sheet give it one more press for a full 15 seconds. PRO TIP: Make sure that you can see the fibers of the shirt through the vinyl once it is pressed. This way you will ensure that the vinyl is properly adhered. For more washing instructions and a printable care card head over here. 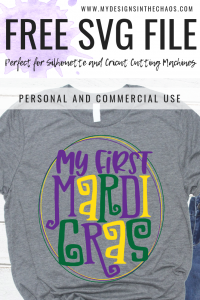 Your Mardi Gras shirt is now ready! And… even better you have the skills to be able to make shirts with as many layers as you can imagine. Now see…. that wasn’t so bad was it? Just a little more time consuming than working all in one color but still totally doable and the results are gorgeous. Looking for more inspiration? 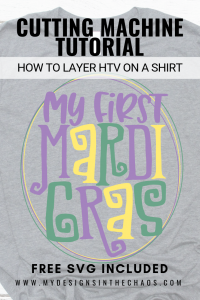 Check out this post HERE where we walk through the steps of how to create a Valentine’s Shirt with HTV. 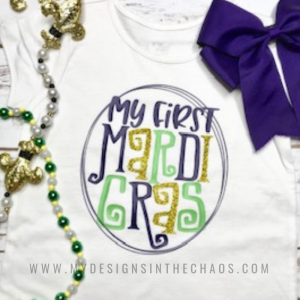 Check out THIS POST for 5 additional Mardi Gras freebies. We are so grateful that you are here and would love if you would take a second and pin an image from above. Thank You! Happy Crafting, Cutting, and Chaos!